I visited this delightful bookshop on a warm Thursday afternoon a couple of weeks before the schools broke up for the summer. It was deliciously quiet in there. A backdoor was open and a refreshing breeze made both the shop and the café bearable. 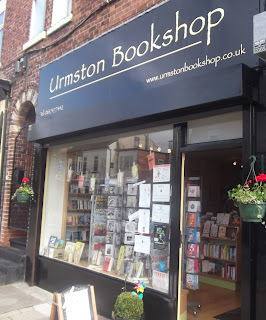 I first met owners Frances and Peter Hopkins when they supplied the books for the Prestwich Bookfest. It’s clear that they work very hard, and that owning an independent bookshop is very demanding and is about more than selling books. The bookshop hosts several reading groups, holds book launches and photographic exhibitions and occasional film nights. There is a back room and this is sometimes hired out for meetings and workshops. The café is tiny but a real treat. There are just a few what I would call proper bistort tables and attractive olive-green folding chairs. The cakes are pretty but delicious, too. They are supplied by local independent enterprises - The Bear Who Bakes, Elaine’s Creative Cakes and Urmston cakes. I settled for the lemon drizzle and one of the best cups of tea I ever drunk. My purpose was two-fold in visiting the shop that day. I wanted to buy some books for a course I’m teaching next year. I also wanted to check out the café and see if it passed muster. I’m pleased to say the café is joining the project. It’s good also to support an independent bookshop Sure, I buy books and sell my own via Amazon – and don’t have a guilty conscience about that. But it’s good to go into a bookshop and browse – especially when you’re looking for picture books. I hope the Hopkins will be able to carry on for many more years.